Album sampler quilt comprised of 30 blocks, each in a different pieced or appliqued pattern. 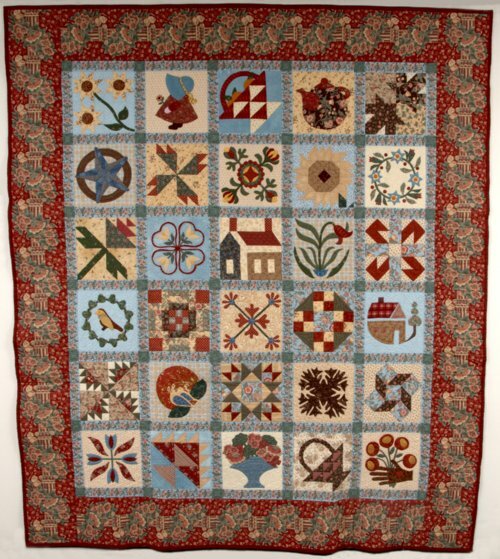 Quilt incorporates a wide variety of reproduction 19th century textiles designed for Moda Fabrics by Kansas quilt historians Barbara Brackman and Terry Clothier Thompson. Machine quilted in a different pattern on each block. An inscription sewn to backing lists the pattern names, designers, and sewers of each block. This quilt was made in 2006 by members of the Kaw Valley Quilters Guild, Lawrence, to celebrate the group's 30th anniversary. The 30 blocks feature patterns taken from the Guild's block-of-the-month collection over 30 years. Patricia Ann Marlo Sullivan of Topeka won the quilt in a drawing.